"Arcimboldi" redirects here. For the cardinal, see Giovanni Arcimboldi. Giuseppe Arcimboldo (Italian: [dʒuˈzɛppe artʃimˈbɔldo]; also spelled Arcimboldi) (1526 or 1527 – July 11, 1593) was an Italian painter best known for creating imaginative portrait heads made entirely of objects such as fruits, vegetables, flowers, fish, and books. Four Seasons in One Head, National Gallery of Art, USA. In 1562, he became court portraitist to Ferdinand I at the Habsburg court in Vienna, Austria and later, to Maximilian II and his son Rudolf II at the court in Prague. He was also the court decorator and costume designer. Augustus, Elector of Saxony, who visited Vienna in 1570 and 1573, saw Arcimboldo's work and commissioned a copy of his The Four Seasons which incorporates his own monarchic symbols. After a portrait was released to the public, some scholars, who had a close relationship with the book culture at that time, argued that the portrait ridiculed their scholarship. In fact, Arcimboldo criticized rich people's misbehavior and showed others what happened at that time through his art. In The Librarian, although the painting might have appeared ridiculous, it also contained a criticism of wealthy people who collected books only to own them, rather than to read them. He is known as a 16th-century Mannerist. A transitional period from 1520 to 1590, Mannerism adopted some artistic elements from the High Renaissance and influenced other elements in the Baroque period. A Mannerist tended to show close relationships between human and nature. Arcimboldo also tried to show his appreciation of nature through his portraits. In The Spring, the human portrait was composed of only various spring flowers and plants. From the hat to the neck, every part of the portrait, even the lips and nose, was composed of flowers, while the body was composed of plants. On the other hand, in The Winter, the human was composed mostly of roots of trees. Some leaves from evergreen trees and the branches of other trees became hair, while a straw mat became the costume of the human portrait. In 1976, the Spanish sculptor Miguel Berrocal created the original bronze sculpture interlocking in 20 elements titled Opus 144 ARCIMBOLDO BIG as a homage to the Italian painter. This work was followed by the limited-edition sculpture in 1000 copies titled Opus 167 OMAGGIO AD ARCIMBOLDO (HOMAGE TO ARCIMBOLDO) of 1976–1979 consisting of 30 interlocking elements. The works of Arcimboldo, especially his multiple images and visual puns, were rediscovered in the early 20th century by Surrealist artists such as Salvador Dalí. The exhibition entitled "The Arcimboldo Effect: Transformations of the face from the 16th to the 20th Century” at the Palazzo Grassi in Venice (1987) includes numerous 'double meaning' paintings. Arcimboldo's influence can also be seen in the work of Shigeo Fukuda, István Orosz, Octavio Ocampo, Vic Muniz, and Sandro del Prete, as well as the films of Jan Švankmajer. Arcimboldo's works are used by some psychologists and neuroscientists to determine the presence of lesions in the hemispheres of the brain that recognize global and local images and objects. Giuseppe Arcimboldo did not leave written certificates on himself or his artwork. After the deaths of Arcimboldo and his patron—the emperor Rudolph II—the heritage of the artist was quickly forgotten, and many of his works were lost. They were not mentioned in the literature of the 17th and 18th centuries. Only in 1885 did the art critic K. Kasati publish the monograph "Giuseppe Arcimboldi, Milan Artist" in which the main attention was given to Arcimboldi's role as a portraitist. With the advent of surrealism its theorists paid attention to the formal work of Arcimboldo, and in the first half of the 20th century many articles were devoted to his heritage. Gustav Hocke [de] drew parallels between Arcimboldo, Salvador Dalí, and Max Ernst's works. A volume monograph of B. Geyger and the book by F. Legrand and F. Xu were published in 1954. 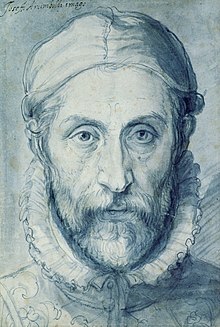 Since 1978 T. DaCosta Kaufmann was engaged in Arcimboldo's heritage, and wrote of the artist defended his dissertation "Variations on an imperial subject". His volume work, published in 2009, summed up the attitude of modern art critics towards Arcimboldo. An article published in 1980 by Roland Barthes was devoted to Arcimboldo's works. The main object of modern art critics interpretation are the "curious" paintings of Arcimboldo whose works, according to V. Krigeskort, "are absolutely unique". Attempts of interpretation begin with judgments of the cultural background and philosophy of the artist, however a consensus in this respect is not developed. B. Geyger, who for the first time raised these questions, relied mainly on judgments of contemporaries—Lomazzo, Comanini, and Morigia, who used the terms "scherzi, grilli, and capricci" (respectively, "jokes", "whims", "caprices"). Geyger's monograph is entitled: "Comic pictures of Giuseppe Arcimboldo". Geyger considered the works of the artist as inversion, when the ugliness seems beautiful, or, on the contrary, as the disgrace exceeding the beauty, entertaining the regal customer. A similar point of view was stated by Barthes, but he reduced works of the artist to the theory of language, believing that fundamentals of Arcimboldo's art philosophy is linguistic, because without creating new signs he confused them by mixing and combining elements that then played a role in the innovation of language. Arcimboldo speaks double language, at the same time obvious and obfuscatory; he creates "mumbling" and "gibberish", but these inventions remain quite rational. Generally, the only whim (bizarrerie) which isn't afforded by Arcimboldo – he doesn't create language absolutely unclear … his art not madly. Arcimboldo's classification as mannerist also belongs to the 20th century. Its justification contains in Gustav Rehn Hok's work The world as a Labyrinth, published in 1957. Arcimboldo was born in the late Renaissance, and his first works were done in a traditional Renaissance manner. In Hok's opinion, during the Renaissance era the artist had to be first of all the talented handicraftsman who skillfully imitated the nature, as the idea of fine art was based on its studying. Mannerism differed from the Renaissance art in attraction to "not naturalistic abstraction". It was a continuation of artistic innovation in the late Middle Ages—art embodying ideas. According to G. Hok, in consciousness there is concetto—the concept of a picture or a picture of the concept, an intellectual prototype. Arcimboldo, making a start from concetti, painted metaphorical and fantastic pictures, extremely typical for manneristic art. In On Ugliness, which was published under Umberto Eco's edition, Arcimboldo also admitted belonging to manneristic tradition for which "...the preference for aspiration to strange, extravagant and shapeless over expressional fine" is peculiar. Arcimboldo-style fruit people appear as characters in the films The Tale of Despereaux (2008) and Alice Through the Looking Glass (2016), as well as in the Cosmic Osmo video game series. In Harry Turtledove's fantasy detective novel, The Case of the Toxic Spell Dump, the alternate history's version of Arcimboldo incorporated imps – a common, everyday sight in that world – along with fruit, books, etc., into his iconic portraits. Arcimboldo's painting Water was used as the cover of the album Masque by the progressive rock band Kansas, and was also shown on the cover of the 1977 Paladin edition of Thomas Szasz's The Myth of Mental Illness. ^ "Giuseppe Arcimboldo Biography". Giuseppe-arcimboldo.org. Retrieved 2012-07-16. ^ Maiorino, Giancarlo. The Portrait of Eccentricity: Arcimboldo and the Mannerist Grotesque. The Pennsylvania State University Press, 1991. Print. ^ a b Elhard, K. C. "Reopening the Book on Arcimboldo’s Librarian." Libraries & Culture 40.2 Spring 2005. 115–127. Project MUSE. ^ ROSENBERG, KAREN (September 23, 2010). "Several Obsessions, United on the Canvas". NY Times. Retrieved 30 December 2012. ^ Melikian, Souren (October 5, 2007). "Giuseppe Arcimboldo's hallucinations: Fantasy or insanity?". NY Times. Retrieved 30 December 2012. ^ a b Ferino-Pagden 2007, p. 15. ^ Carol Vogel (September 16, 2010). "Arcimboldo Work Bought in Time for Exhibition". The New York Times. Retrieved 2014-10-31. ^ Blake Gopnik (September 17, 2010). "Arcimboldo's 'Four Seasons' will join National Gallery of Art collection". Washington Post. Retrieved 2014-10-31. ^ Ferino-Pagden 2007, p. 97—101. ^ Bolaño, Roberto. 2666. Farrar, Straus and Giroux, 2008, pps. 729, 784. Wikimedia Commons has media related to Giuseppe Arcimboldo. Giuseppe Archimboldo collection at the Israel Museum. Retrieved September 2016.